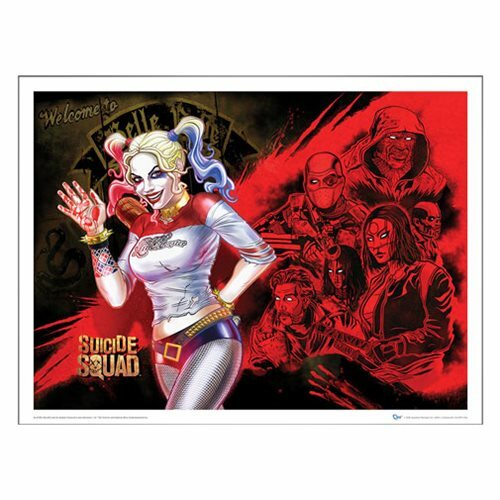 Crazy, sassy Harley Quinn waves a bloody hello as she heads off with the Suicide Squad in the Suicide Squad Harley's Heroes Art Print! Harley's in the spotlight, wearing her tight Daddy's Lil Monster T-shirt and a big smile. Team members Deadshot, Killer Croc, El Diablo, Katana, Enchantress and Captain Boomerang follow in her wake. QMx is proud to offer Harley's Heroes, an original design featuring DC Comics' Suicide Squad from Zombie Yeti (Jeremy Packer), a graphic artist whose style reflects his love of comic books and cartoons. 24-inches x 18-inches. Printed on 100 lb satin-finish paper. Ages 13 and up.